Wavy oval motifs in caramel and ivory tessellate across the front of this sophisticated cushion from Peru. Featuring a design by Roberto Huarcaya, the cushion cover is handcrafted of carefully selected alpaca blend fibers with a pleasing texture. A cotton back finishes this decor accessory, featuring a slit for inserting a cushion. 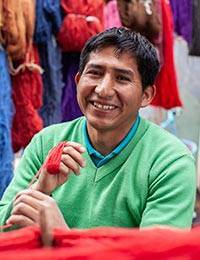 "Growing up in a weaving community influenced me greatly, as my family and neighbors worked their whole lives as weavers." "I'm Roberto Huarcaya Huamán and I was born in 1978 in the Ayacucho region, which is known for its architectural tradition and art. "I'm creative and innovative, with a style of my own. When I was a young boy, I especially liked our looms and bright yarns. Growing up in a weaving community influenced me greatly, as my family and neighbors worked their whole lives as weavers. I always loved seeing the colors, so full of life, and their combinations. I found it wonderful that all kinds of images and icons could be created on the loom. "My parents and brother taught me weaving techniques when I was young. My father died when I was 12 and it was a difficult time for me and my family. It wasn't easy, but it meant putting into practice my perseverance, dedication and patience. I looked to other weavers with experience who created complex designs and gradually began perfecting my technique and my art. "To practice, I begged one of the workshop owners to give me a chance to work. I eventually mastered this passionate, complex and beautiful art. I enjoy creating my own designs and dyeing the yarn in the colors I love. My own technique is quite personal. The challenge is being able to discover dyes derived from plants. "For my designs, I'm inspired by the beauty of nature, its landscapes and the contrasts between cool and warm colors. I look through images and reference the ones that inspire me. I mostly use wool, alpaca fleece and cotton yarn. "My dream is to have my own workshop and continue growing as well as seeing my children's professional future."